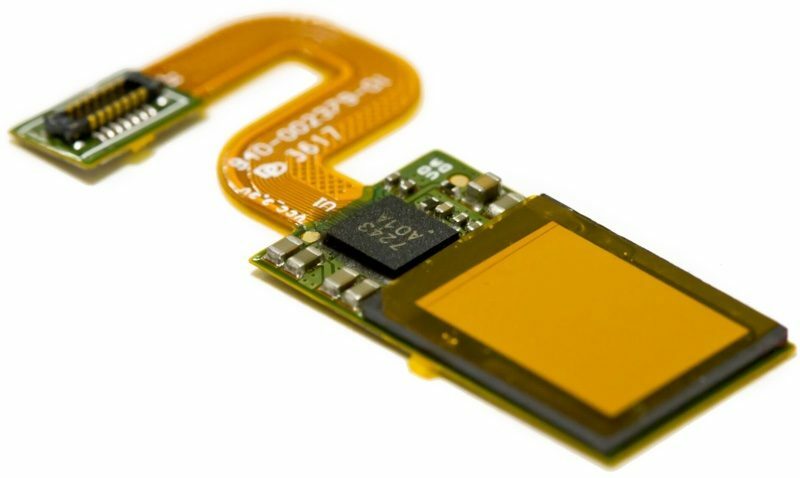 Synaptics today announced that it has begun mass production of its Clear ID FS9500 optical in-display fingerprint sensors in partnership with a "top five" manufacturer, suggesting at least one major smartphone brand will sport in-display fingerprint sensing technology in the future. 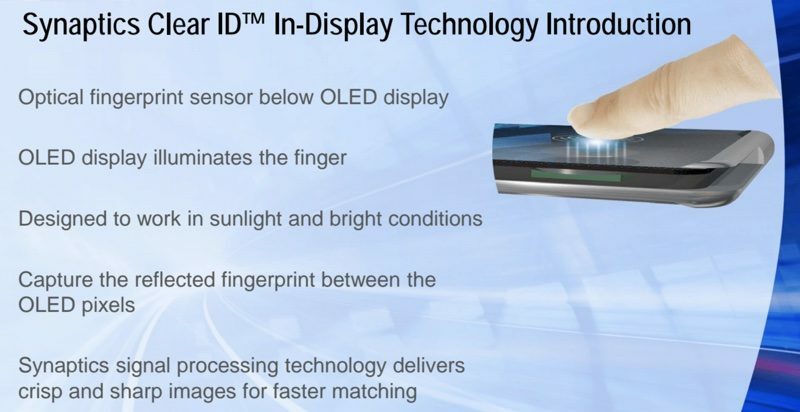 Synaptics has been working on fingerprint sensors capable of reading a fingerprint through display glass for some time now, and its first product, the Clear ID-FS9100, was announced back in late 2016. 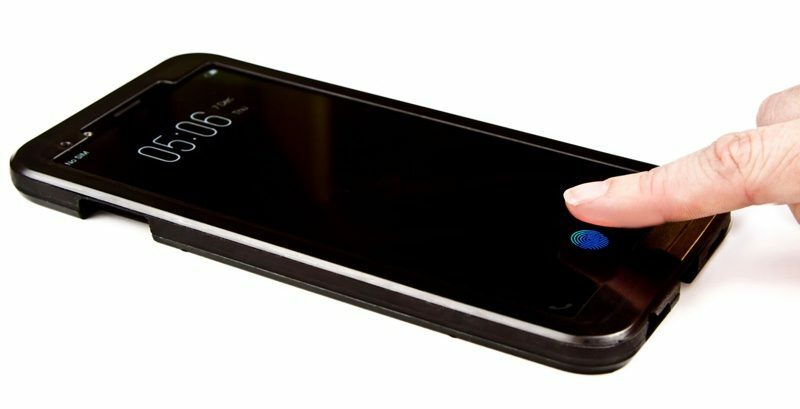 The updated Clear ID-FS9500 fingerprint sensors are designed specifically for smartphones with button-free bezel-free "infinity displays" much like the iPhone X or the Samsung Galaxy S8. Synaptics says its fingerprint sensors "magically activate" in the display when necessary, and the company believes its solution is "twice as fast as 3D facial recognition." The Synaptics fingerprint sensor works well with wet, dry, and cold fingers, and because it's located under the display glass, the sensor is scratch proof and waterproof. In response to facial recognition, which can fail at certain angles, Synaptics points out that its fingerprint solution works when a device is "sitting on the table, at any angle, or while in a car mount." Synaptics did not specify which smartphone manufacturer it is working with beyond naming a "top five" OEM, so the company's partner is a mystery. While Synaptics is a known Apple supplier that has provided Apple with display components in the past, it's likely Synaptics is referring to an Android manufacturer. Samsung, Oppo, Vivo, and Huawei are all possible partners. Apple uses its own in-house solution for Touch ID, and it's not yet entirely clear at this point if Apple plans to continue using fingerprint recognition as a biometric authentication method in its devices. Touch ID has been replaced by Face ID in the iPhone X, and rumors suggest Face ID will be the dedicated biometric authentication method in the 2018 iPhones. We're also hearing rumors suggesting Face ID will come to other devices in 2018, like the iPad Pro. In a September interview, Apple software engineering chief Craig Federighi said Face ID is the future of biometric authentication, and other Apple executives have made similar comments. For those who hold out hope that Apple will continue to use Touch ID in some capacity, however, Federighi did also say that there are certain situations where different biometric techniques or combinations of biometrics could make sense. Ahead of the release of the iPhone X, rumors indicated Apple was planning to put Touch ID under the display of the iPhone X, with Face ID selected as the fallback option when it did not work out, but Apple executives have since said those rumors were false. Under-display Touch ID was not considered as Apple worked on developing Face ID, and it's not clear if Apple will continue to pursue Touch ID development with Face ID now available. Don't worry it won't happen. Next year Samsung will have it. Then in 3-4 years Apple will "invent" it. If Samsung were smart, they would push hard for touchid under the screen over trying to copy Face ID. I never want to go back to TouchID. The FaceID is awesome. I think I adapted in to it in the first minute I had my X. It now seems primitive when I have to unlock my iPad and MacBook Pro. Thought I'd really miss Touch ID when I got the iPhone X but I have to say that Face ID is so much better in my opinion. Don’t see the point. If you have to look for and place your finger in a specific spot, by then your phone would already be unlocked with Face ID. Without some sort of indentation to feel for, you’d have to pay attention each time. I'd love to know how many people here complaining about the problems with FaceID (and how in-display TouchID would be better) actually own the iPhone X. You think Apple would remove a feature and then bring it back? Better hold on to your headphones.